Our solar system is expecting another body very soon, as mass from Saturn's rings clump together into a new moon. With all our research into the distant reaches of space, it's easy to forget that there's still interesting astronomical activity going on right on our doorstep. Saturn, a planet that could already have its own episode on Cosmic Hoarders with 62 moons, is working on number 63 at this very moment. Recent findings from NASA detected a bulge in Saturn's outermost ring, which seems to be the early stages of moon creation. 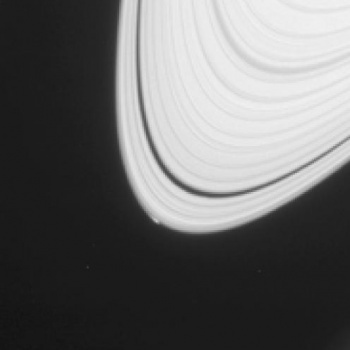 Saturn's rings are composed of a whole lot of rock and ice, so it's got quite a bit of mass. The new moon (which hasn't been directly seen yet) is the result of this matter slowly accreting, gaining mass and increasing its gravitational pull to gain more mass. At this point it's large enough for us to detect, but still relatively tiny, measuring only half a mile in diameter. It's still growing, though, and it has plenty of time to collect more mass before it eventually drifts out of the rings. The moon hasn't been formally classified, so the very serious scientists at NASA have given it a very serious nickname: Peggy. Once little Peggy finishes growing up and leaves the nest, it'll get a more official (and probably less adorable) name. Scientists speculate that Peggy may be the last moon Saturn ever forms, keeping the total number just short of a nice even 64. There's only so much matter in the rings, and while they aren't in any danger of disappearing, it's unlikely that any more moons will be able to form from what's left after Peggy leaves.